There are so many times in our lives that someone might not be thanked for what they do. It really doesn't matter what field you are in, or what you do as an occupation, we all liked to get thanked for what we do. While Tom over at Tom's Take On Things realizes this, he does want everyone to think about our soldiers in the U.S. Army, Marines, Air Force, Navy and the Coast Guard. Tom once was a soldier. He served in Desert Storm/Shield and completed his time of 6 years by doing the best that he could. He recognizes what a soldier gives up to help support and defend this land that we are in. He wants others to see it too. That is why this giveaway is dedicated to those who serve or served in the Armed Forces. Have you ever thanked a soldier for their service? 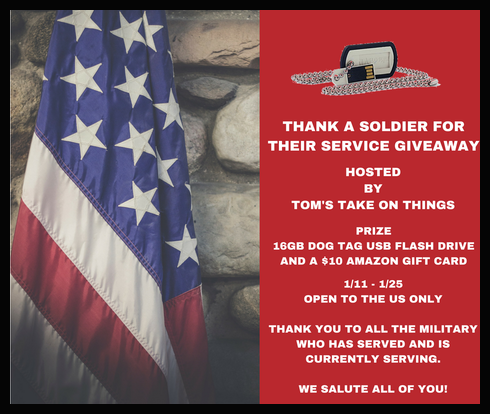 Tom along with the help of bloggers promoting this giveaway like me would like to give everyone a chance to win this 16gb Dog Tag themed USB Flash Drive and a $10 Amazon Gift Card. Tom's Take On Things is responsible for prize delivery. This blog was not compensated for sharing this post. Giveaway ends 1/25 at 11:59 pm EST. The winner has 24 hours to respond to winning email.